According to the oldest historical records, the La Orotava Dragon tree has been the most famous and admired of its kind, known as Franchy’s Dragon tree because it grew in the magnificent garden that this family owned in Villa de La Orotava. According to tradition, this imposing Dragon tree was sacred for the Guanches (Tenerife aboriginals), who met in council or ‘tagoror’ under its splendid treetop to enact laws, administer justice and crown the Taoro Mencey (aboriginal ruler of this area), when the previous one died. During the coronation ceremony the new Mencey kissed a bone of his earliest ancestor while repeating ‘Agoñe Yacaron Yñatzahaña Chacoñamet’ (I swear on your bones the day you became great). In 1496, next to it, a mass was celebrated to commemorate the definitive conquest of the island and it served as point of reference in the division of lands among the conquerors. Much has been written about the age of the historic Dragon tree. Some authors of past centuries (Humboldt, Piazzi-Smyth, who installed the first telescope in Mount Teide in the middle of the nineteenth century, etc. ), attributed it several thousand years, but although we will never know for sure, there is no doubt it was more than one thousand years old. In the mid-eighteenth century it was about 20 metres high and the perimeter of its base measured around 25. The trunk became narrower as it ascended up to a height of 6 metres, where twelve large branches sprung. Its circumference was about 14 metres and its weight must have been something more than 200 tons, like the weight of 40 adult elephants. In its treetop a large wooden platform was built, and people could access by means of a comfortable exterior staircase. Over time, the Arautava Giant became a kind of meteorological oracle for the peasants of the region since, according to an old belief, depending on which side the tree blooms, you can predict how the following year will be in terms of weather. If it does so on its north or northwest sides, there will be a rainy year on the north and northwest slopes of the island; if it blooms on all sides it will rain abundantly, but if it blooms on its south or east sides, the year will be dry and therefore bad for the crops. During the Enlightenment its fame spread throughout the European intellectual circles and many illustrious travellers who visited La Orotava had the opportunity to admire it in its best years. Ledrú, Stauton, Humboldt, D'Ozonne, Viera y Clavijo or Agustín de Bethencourt were able to study and measure it and thanks to their descriptions and drawings we have valuable information about this Giant. The magnificent garden was designed in French style, with rectilinear walks delimited by hedges of myrtle, rose, jasmines, lemon and orange trees, laurels, small-leaved hollies and Indian bays, among which a magnificent example of Canary palm, known as ‘Palma de la Conquista’ (Conquest Palm) stood out. Its name made reference to its age and height (30 metres), visible from all corners of the La Orotava Valley. 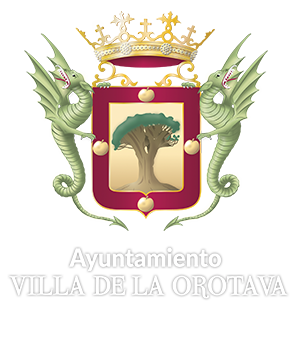 In the Villa de La Orotava Coat of Arms, granted by the king Alfonso XIII on 15th February 1905, a Dragon tree is its central element, in representation of the leafy and corpulent tree we have been dealing with, besides four apples guarded by two dragons, in imitation of the golden apples that were in the Garden of the Hesperides, present in mythology and in the crown of the Catholic Monarchs. On the night of 21st July 1819, a terrible hurricane knocked over half its treetop, leaving behind only five surviving branches. The last scientist who saw it alive was the German zoologist and doctor Ernst Häckel in 1866. A year later, on 7th March 1867, a strong gale finally knocked it down. One of the great wonders of Nature, the Franchy Garden Dragon tree, the Arautava Giant, the most beautiful of all Dragon trees on the islands, and perhaps all over the globe, had died! Currently a young Dragon tree grows in the same garden and in the same place the old one used to have. This new Dragon tree will grow and new chronicles about the trees of the La Orotava Valley will be written. House of Franchy. It is a centenary Dragon tree of great botanical interest that gives name to this architectural complex of traditional style. Experts calculate its age in more than two centuries - perhaps the oldest one of those who live in La Orotava - and whose state of health can be considered as more than acceptable. Address: La Candelaria street. Candelaria del Lomo. 3.- The Botanic Garden Extension Dragon Tree. After the demolition of the convent of San Jose in 1868, the space occupied by its orchards, was converted into a garden-nursery for the La Orotava Botanical Garden. In 1888 the enclosure was delimited and, at the beginning of the 20th century, a wrought iron gate of eclectic design was placed, with its outstanding access door from where you can see the magnificent dragon tree specimen located at the entrance of the garden. ‘Hijuela del Botánico’ (Botanic Garden Extension). 4.- Gardens under the ‘Carrera del Escultor Estévez’ bridge. The Dragon tree grove. In the nineteen sixties, the sector stretching from Calvario street to La Carrera street through Constitución square, underwent a profound transformation with the construction of the popular bridge that would connect both streets. The accentuated drop between the square and Rosales street gave rise to the creation of municipal gardens with several specimens of dragon trees. 5.- Domínguez Alfonso promenade dragon tree. It is considered one of the most beautiful ones in La Orotava, due to its well-structured and balanced bearing. It is apparently healthy, since it does not present scars. It is located at the back of some buildings you will find on the north side. This promenade also counts with araucarias that embellish it. 6.- Cólogan street dragon tree. Property with a stone platform and a staircase attached to its facade, by its main door. This characteristic has conferred it the popular name of ‘the house of steps’. In its garden there is a magnificent specimen of dragon tree that can also be observed from Viera street. In this location there also used to be a singular chestnut tree that, according to Viera y Clavijo, dated back to the conquest of the island and which was demolished by a hurricane in 1953. 7.- San Francisco Square and Gardens. Dragon trees. After the fire that destroyed the old convent of San Lorenzo in 1801 a triangular space adapted to the existing buildings was drawn with the intention of using it as a square. It was Antonio Lugo and Massieu, an illustrious neighbour known for his promotion of nature, who proposed what trees should be planted in the area. Until the 1940s, the square was nothing more than an esplanade where the livestock fair took place every year during the celebration of the Patron Saint's Festivities. It was then that the square was rearranged and planned with the laying of pavement and the delimitation of the garden areas in which several native species were planted. 8.- La Mocana Dragon tree. It is located in the ​​La Mocana area, next to the San Antonio ravine. The northern branch was broken by lightning, which gives it an uncompensated appearance, although the agricultural environment, the nearby homes and the orchards in which it is planted attract attention and create a very colourful picture. 9.- El Rincón Dragon Tree. In the agricultural area of El Rincón we can find this rare specimen of dragon tree that seems to be carved by the trade winds, situated on a difficult to access and quite steep slope. Each one with its particular story, with its historical memory and in the heart of its Valley ... And Father Teide is offering his shelter above them all. A set worthy of enjoyment that causes admiration for its longevity and beauty!